My brother would have been 22 today. Yesterday, I told my son that Jeremy would have been 21, but I think it is actually 22. I have been thinking about Jeremy today. It has been distracting me quite a bit. I have been sort of sad. I guess at 22 he would be close to graduating from college. I still picture him as a little kid, so thinking of him about to take place in a college graduation sort of blows my mind. Last time I saw him, he was a teenager, but basically I think of him as Tyler's age. I probably always will. I am not sure if that means I will always think of him as 5 or 6 or if that means that whatever Tyler's age, that is the age I will think of Jeremy. Probably, the later. Very often I see Jeremy in Tyler. Something about some of his facial features and expressions makes me think a lot of Jeremy is in Tyler. Sometimes that scares me. I have an unjustified fear that somehow I will lose my boy. I know there is no more reason to think something bad will happen to Tyler because he reminds me of my brother than there is for any child. But often I am more concerned about losing Tyler to some tragedy than I about Connor. As crazy as Connor is, it should be just the opposite. Tyler asked me last night why Jeremy died. I do not have a good answer for that question. I avoided it by talking about Jeremy's heart. But the simple truth is I do no know why Jeremy died. I guess I could go with "because God wanted Jeremy with him". But why God had to have him at 15 instead of 85 is a mystery to me. It does not really bother me that I don't understand. But, I absolutely do not understand how a seemingly healthy 15 year old kid would die. I guess it is just one of those things I will ever fully comprehend. There are a lot of those things that are beyond my comprehension. I think Jeremy's death is at the top of my list. I am trying to think where he would have gone to college. My answer (since I can pick anywhere) is Colorado University. Somewhere in Illinois is probably more likely, but today I picture him close to my home. We probably would have seen each other quite a bit had he come to school in Colorado. Of course now I will never know. Well, anyway, Happy Birthday Jeremy. We went camping this weekend up in Rocky Mountain National Park. The weather was less than ideal, but I am still glad we went camping. I just wish the weather would have cooperated a bit more. Because of the weather I got to use our little tent heater. This is the first time we have used it out of need. I tried it out once simply to test it. Friday night (actually Saturday morning) it was cold enough that I fired it up out of concern for the kids' comfort. They told me the next day that they were warm enough all night in their sleeping bags, so I guess it was not absolutely necessary. We also drove into town for breakfast Saturday and coming back did as many indoor things as we could. We spent a long time in the visitors center and the "Moraine Park Museum". Afternoon was actually decent. I went for a hike while Connor took his nap and Tracy and Tyler did stuff around the campsite. Luckily Sunday was nice enough that the whole family could hike together. Connor was on my back most of the way, but Tyler hiked almost 5 miles round trip. We went to Cub Lake which is a very popular hike starting close to our campsite. It took us about 6 hours with a really long lunch and a big rest at the lake. It definitely took a large portion of the day. Connor got his nap in the kid-carrier which does not seem at all comfortable, but he did not seem to mind. My legs are pretty sore from the two hikes. Most of the soreness comes from carrying a somewhat large 3 year old on my back up and down mountainous terrain for several miles. I still think he weighs a bit less than my backpacking pack, but not a whole lot less. I skipped my workout night last night to watch the cup finals game last night, but if I were not so sore I probably would have at least gone for a little workout. I also got to try out the new camping stove that I got for Christmas. Sunday morning was just boiling water for oat meal and coffee. My little old camping stove was fine for boiling water. But Sunday I made sausage and pancakes. My old stove just sucked at anything like that. The new one ROCKS. It has a nice big griddle that fits over all three burners and is the perfect size for cooking multiple things. Perfect for pancakes and sausage. I was really really happy with the new stove and how nice the pancakes turned out. It makes me wonder why I tolerated the old one so long. Well... The reason is actually obvious; I am cheap. I never would have spent money on this myself so it is one of those awesome gifts. Thanks Tracy (Tracy never reads this so she will not be getting a big head). Apparently there was "bear activity" in our campground the first night we were there (the really cold and windy night). One of the rangers came by in the morning to remind us not to keep food or any other nice smelling things in the tent. Of course, when we checked in we got the same talk as we were in "bear country". I am not sure I see the difference between there having been a bear in the camp and there potentially being a bear in the camp. Either way, it is a bad idea to keep food in the tent. What is sad is that the Ranger probably convinced some people to be more careful just by telling people there actually was a bear. I would venture to guess that usually when a bear goes through a campground, no one notices. So, being more careful just because someone noticed seems ridiculous to me. Anyway, once again I was disappointed to miss seeing the bear. We did see a bunch of Wapiti (Elk). A large number of them had on collars with antennas .... Presumably transmitters. It takes away from the thrill when the wild animal has a man-made collar on. I also saw a rather large coyote slinking through the campground in the dark. Well, I am assuming it was a coyote because it was way too big to be a fox and the only other choice would be a small wolf. It also could have been a ghost - canine for all I know. I have been seeing a lot of coyotes recently. They wander around our neighborhood in the mornings and evenings. Anyway... I am glad we went camping. I am looking forward to the next trip of the summer. Well... I am on the light rail today. Trying to save a little gas. When I ride the train, I usually blog on my phone, but today I do not really have much to say. Or at least I cannot think of a topic. Unfortunately, I forgot to bring the earphone adaptor for my phone so I cannot even listen to music. 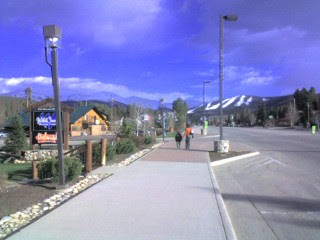 The attached picture is from this weekend up in Winter Park. Auction Automations had an event in Tabernash and while it was not my event to work I went up with Tracy and the kids to be "on call". The charity paid for our rooms, so there was no big reason not to go. The Winter Park valley seems to be the worst hit by the pine beattle epidemic. If you don't know, pine beattles are destroying a huge portion of Colorado's pine forests. Pine beattles lay eggs and their grubs eat pines. The pines die. It has gotten pretty bad. Most of the trees in the winter park area are dead and brown. The only thing to do is cut down the dead trees and wait for them to be replaced by aspen. I suspect fire wood will be pretty cheap for quite some time. Although, it may be that they want to keep that wood quarentined, so I will not get benefit. Unfortunately, Tracy's family is having a reunion up there at the end of June. Reservations had to be made almost 2 years ago. At the time we knew about the pine beattle epidemic, but I did not realize that it would ever get this bad. And it is not just Winter Park / Frasier valley. I think I heard that eventually 90 percent of our pine forests will be wiped out. Years from now, colorado's evergreens will be replaced by Aspen. I wonder if there is an Aspen Beattle. Of course, global warming is a big reason for triving pine beattles (isn't every negative thing in today's world at least partially caused by global warming?). The cold mountain winters are apparently no longer cold enough to control their populations. Another means to control the pine beattles is forest fire, which with so many people now living in he mountains are no longer allowed to clean up forests. Of course, forest fires also tend to kill pines. One interesting thing to me is that it seems the whole purpose of the pine beattle is to destroy its food source. If the pine beattle population accomplishes its purpose there will be no more trees and so the pine beattles will die off. And you would think 1 tree would be enough food for millions of these little things. But they do not seem content at all to stay put. Nope, they have to destroy thousands of trees. Greedy little bastards. I am sure that in the whole scheme of things, the grand design of creation, Pine Beattles have an important role. I do not know what it is. It probably has something to do with keeping forest areas healthy by getting rid of old obsolete trees. Somehow the balance maintains itself if man does not screw with it, but we have somehow done something that allows Pine Beattles go out of control. This is where global warming or over controling forest fires or something comes in. I am sure this is all our fault. Probably specifically the fault of white christrian capitalist males. I blame the tweedle beattles. It started snowing at our house this morning after a night of rain. Most people I know complain about this weather in May. Personally I like the fact that we can get snow this late in the year. It is certainly better than living someplace with no snow. Plus we keep hearing how dry this summer is expected to be so any moisture we get at all is a good thing. Of course, in a couple of weeks we are going camping at Rocky Mountain National park. I do not want the weather to be cold and rainy then. If was just me, I would love camping in the snow. I think even just me and Tyler would have fun. But Tracy and Connor are not camp-in-snow kind of people. Connor is just a bit young and gets to the "I want to go home." chant too easily. Tracy, although she does not really complain and claims to be having fun is just too much of a girl to enjoy non-perfect weather camping. By the way, I like that she is a girl. Back to today's weather: between yesterday and today we went from mid to high 70s to what should be a high of 35 or 40 today. Crazy. Part of the complaint around here is that such a swing is hard to handle. It is hard to know how to dress; people claim temperature swings cause sickness; etc.... Again, I think this is part of what is so great about living here. These sort of people do not complain when we get gorgeous warm winter weather the next day after a winter snow. I would not be surprised if this is the last snow we get this year. Crazy weather. I wonder if this is part of global warming. One thing I do not like about this weather is how hot they keep the train. Holy cow I am burning up on the light rail. I am taking the light rail again because of the afternoon Rockies game today. I forgot to get off in time for my regular stop so I went up further. Traffic was horrible, and finding a parking spot was a bit of a challenge because I am not used to the parking layout of this stop. Eventually I found the area where there was plenty of parking. It is just a beautiful day today. It makes me wish I could go mountain biking rather than working in front of a computer. I have not been mountain biking in just about forever. I miss it. I really have not been biking nearly as much as I used to. I need to get back into it. I have been having my typical trouble sleeping lately. I keep waking up at about 3:30 and just cannot get back to sleep until I read for about 45 minutes. And then getting up at 6:00 is painful. It does not seem to help if I go to bed later. I am not overly tired once I get going, but I really wish I could sleep all the way through the night or at least get back to sleep once I wake up. Perhaps I should just start my day at 3:30. I am sure at the very least that would change the cycle and maybe completely fix me. The reason I cannot get back to sleep is that I start to think about things I should do. Most often, but not always it is work related. In fact if I cannot figure something out, quite often lots of my ideas of things to try come between 3:30 and 4 in the morning. But most of the thoughts are not worth losing sleep over. Well, my stop is coming up. I am not good at identifying palindromes. I heard the panama one on the radio and typed it into my phone. I am not sure why, but there is something mysterious about palindromes. Something sort of exciting. It is raining this morning. Denver traffic is not very good about dealing with rain. Drainage on the highways is horrible and just about any decent amount of rain results in flooded roads. The traffic report kept talking about closed down ramps and standing water right downtown where I am going today. So I decided to ride the train in. There was one leaving right when I got here. I could have made it but decided to wait. The wait was a bit longer than it should have been, but now I am on the train. I will probably take it tomorrow because there is an afternoon Rockies game and I do not wish to spend time looking for a decent price for parking. Considering how expensive gas is lately, maybe I should make this a regular thing again. It just adds too much time to the commute. Anyway, we got thunder storms last night. I heard thunder starting around 3. That kind of weather is unusual for Colorado. We get a lot of afternoon storms in he spring and summer, but rarely ones in the early morning. My lawn really needs the rain. I am glad we are getting the moisture. I actually sort of like rainy mornings .... Probably from years of living in Washington. And I sort of miss this sort of weather in sunny Denver. Well, I am getting close to my stop. Hope you enjoyed my boring blog. Feel free to use the Palindrome if you would like. Well, I guess Denver does not have to worry about hockey-crazy fans rioting over a Stanley Cup this year. Not only did the wings sweep the Avalanche, but in game 4, just humiliated the team. It was horrible to watch, and to make matters worse, it sure seemed that there were more evil Red Wing fans at the game than fans of the home team. This was especially true later in the game when the wings had 5,6 and maybe even 7 goal leads. The Avs were missing Foresberg, Smythe, Wolski, and Stastny in the final game, and most of those players for most of the series. Even so, a professional hockey team should not lose 8 to 2 in an elimination game. I guess 16W V2 is not happening this year. I am not sure it will be happening any time soon here in Denver. Certainly, if we compare the Red Wings to the Avalanche, the Avs have a long way to go. Well, I guess there is always next year. The number of things that are actually under our control are surprisingly few. "Only you can prevent forest fires" says Smokey. The reality is that most forest fires are caused by lightning or other naturally occurring events, and we are unable to stop them from happening. And truth be told... Naturally occurring fires are important to the natural cycle of life in nature. Ironically, the more we interfere trying to prevent forest fires, the more overdue the cleansing fires become and the worst the inevitable becomes. You cannot prevent cancer or any other disease. It seems that every day something new causes cancer and new deadly viruses are born. Bacteria is now more resistant to anti-biotics in part because of how aggressively (and obsessively) we have tried to defeat germs. You cannot prevent floods or tidal waves or drought or war or famine or homelessness or racism or stupidity. You cannot prevent global warming or cooling. You cannot prevent huge geothermal events or extraterrestrial objects from crashing into the Earth. You cannot prevent your kids from getting in trouble. You cannot prevent them from getting hurt. You cannot prevent them from marrying someone of whom you do not approve. You can not keep from getting old. You will eventually die. All you really control is how you live your life and how you react to all these things that are out of your control. You can control how you treat people and for the most part how you choose to spend your time and energy. Obviously, you can try to influence things. You can eat right and stay away from unhealthy situations. You can raise your children the best you can so they are less likely to have problems. You can help out less fortunate people. But you can not control these things. Just accept that fact and you will probably be better off.